The very first RFC MINI SHOW features Jabberwocky, a Huntington-based dance band that we recorded August 16 at The Blue Parrot. We captured the band performing Eddie Floyd’s “Knock On Wood,” and Stevie Wonder’s “Uptight (Everything’s All Right).” In the future, we hope to bring you some of the band’s original tunes. Jabberwocky’s special blend of styles includes blues, soul and rock & roll, along with a little southern rock and country. A hint of classical training makes their sound something you won’t hear anywhere else. 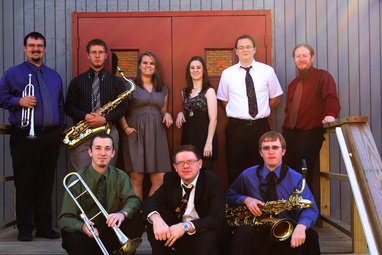 Ace musicians with great singers and a horn section more powerful than a locomotive, Jabberwocky is a band with a bright future. They are scheduled to play the Prestera Benefit on October 12, here in Charleston. We’ll bring you more details as that date approaches. The RFC MINI SHOW is a spin-off of Radio Free Charleston. It’s little bite-sized bits of musical video goodness to help soothe the pain of the long wait between full-length episodes of Radio Free Charleston. But fear not! The next full-sized show is just one week away.